Take a laser-blasting trip into a deadly asteroid field in this issue of Star Wars: The Clone Wars Comic! Ahsoka thinks her simple delivery mission with Artoo is no test for a Jedi Knight in training - but maybe she'll find exactly the kind of action she's looking for! 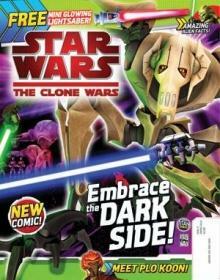 Star Wars: The Clone Wars Episode Guides! Check out two cool episode guides in the latest issue of Star Wars: The Clone Wars Comic, as we breakdown 'Liberty on Ryloth' and 'Hostage Crisis' along with testing tie-in puzzles! Did you know that Cereans have binary brains, along with an additional heart in their heads? The Clone Wars universe is bursting with incredible forms of life. Check out some fascinating facts about the galaxy's greatest non-humans in this issue of Star Wars: The Clone Wars Comic!